Grimsnatch the moggy paced up and down the spell workbench with paws driven by dreadful worry. “It was the full moon last night, and tomorrow is Walpurgisnacht. Where is Barcilla?” he meowed. Alba the white rat peeked from her wall-hole and cleaned her whiskers with nervous paws. “I fear that the inquisition has taken her away to be burned,” she squeaked. Grimsnatch eyed the rat balefully and, cowering, she withdrew to safety. “Then we must rescue her,” he declared, leaping from the bench to sharpen his claws on its scarred wooden legs. When the white rat had punched holes in its brim and tied shoelaces from the mistress’s boots to the pointed black hat, Grimsnatch carried it outside to the herb garden and climbed into it. “Your sisters must take up the strings and carry me,” he directed Mirabee. And together they flew through the night sky, over forest and field, to the village. Barcilla’s hut stood a little apart from the others, for she had no husband and was generally distrusted slightly by the other villagers for her bent leg, that had happened when she was just a baby. But also because she was generally smarter than the others, and knew from her mother what herbs and cures were good for various maladies, the villagers tolerated her and made sure that nobody else bothered her. Grimsnatch dismounted from the hat at the edge of the clearing and stalked closer, ignoring (for once) the mice who rustled through the grain field. He ghosted through the darkness like a shadow, his green eyes taking in all details. The cottage looked untouched, and Barcilla’s chickens clucked softly from their roost. But the cottage was empty. Worry rising like a floodwaters within him, Grimsnatch prowled through the darkened dwelling and searched for a clue. Everything appeared normal, except for the mysteriously missing mistress. The dishes were washed and the linens were laundered, the pantry was stocked and spring herbs dried from lines in the rafters. The wood box was full and a cauldron of stew simmered on the fire. The floors were mopped clean and the curtains were drawn. All was in order, except for one fragrant drop spilled upon the hearth. Grimsnatch sniffed it with cool disdain. He was not a witches’ familiar for nothing – his nostrils quivered as he analyzed the ingredients. A love potion, he’d wager his whiskers and fangs. And then a distant giggle made the moggy swivel his ears. Suppressing a growl, he followed the sound to a bower by the flowing river. It was unthinkable what he found within. The mistress. With a man! 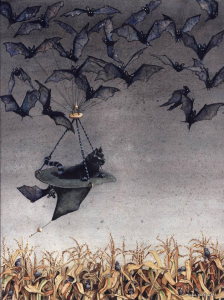 “Mirabee, come quick!” he cried and the bat came with her flock, swooping and circling. They shredded the bower and Grimsnatch sharpened his claws on the interloper’s shins until he shrieked and fled into the darkness. Grimsnatch heard a distant splash as the villager stumbled into the river in his terrified flight. But the mistress was safe, and he leapt into her arms in victory, claiming her as his own.